Category Archives: Will It grow in Louisiana? I happened to mention to a friend that I was looking for recipes which use fresh Louisiana strawberries for my blog. She replied by saying that she has a great recipe which she makes every Easter using local strawberries. 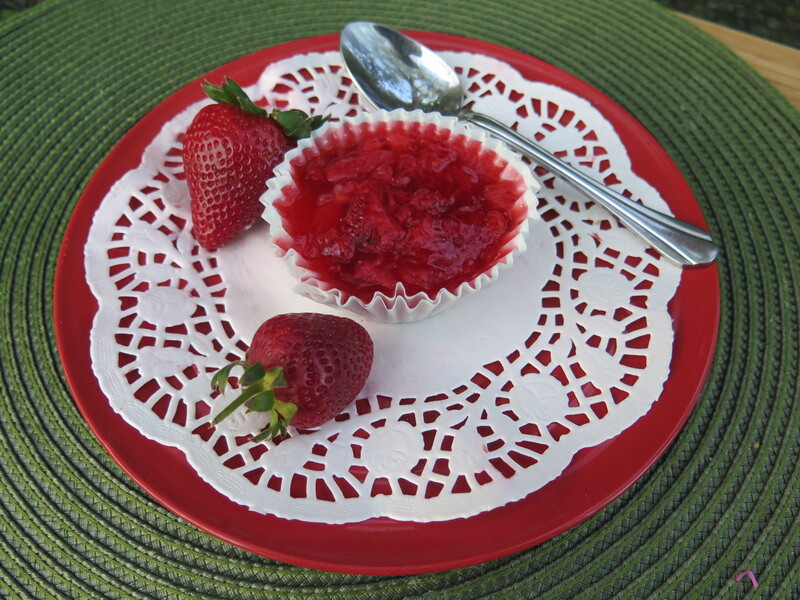 Bonnie shared her family tradition and recipe for “Miniature Strawberry Cheesecakes”. It’s a delightful recipe. Surely everyone will love to eat it! 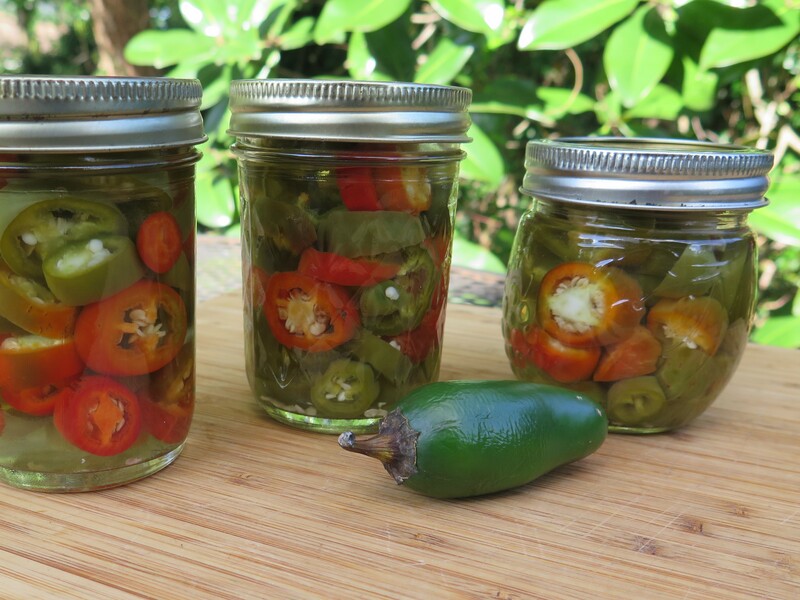 I decided to make a batch of pickled jalapeno peppers with my remaining garden produce. I have just enough of the peppers for three small jars. And surprise. It is really quite easy to make your own pickled peppers. These brined peppers turned out to be crunchy and full of hot flavor — much better than store bought ones, in my opinion. Although they can be kept in the refrigerator for several months, I doubt if they will last that long. This summer, I’ve started on a mission to eat more fruits and vegetables each day. Here’s one way to meet that goal. This recipe features cottage cheese — which was a staple in our meals when I was growing up — and pairs it with fresh summer vegetables. I’d forgotten how tasty this combination was –cottage cheese and garden vegetables. It is one way to meet my goal. I like to support local farmers whenever possible and to purchase their produce. While driving through the countryside about an hour north of here last week, I saw a sign pointing to the Naquin Family Tomato Farm. Wow, I love garden-ripened tomatoes in the summertime. I took a quick detour and stopped in at the roadside packing building. I left with a large bag of vine ripened Celebrity tomatoes. Now to savor the tomatoes and make a few of my favorite dishes such as ripe tomatoes and Tuna Fish Salad. I’m on a mission to cook recipes with the blueberries on my backyard bush. It has my creative ideas going. The berries don’t last long — it’s a huge crop (for me). Here’s a second easy and elegant dessert to make with the blueberries. It is so simple — it fools you. This is a “dump” cake recipe, meaning that you just dump the ingredients directly into the baking dish and mix– no mixing bowls clean up. 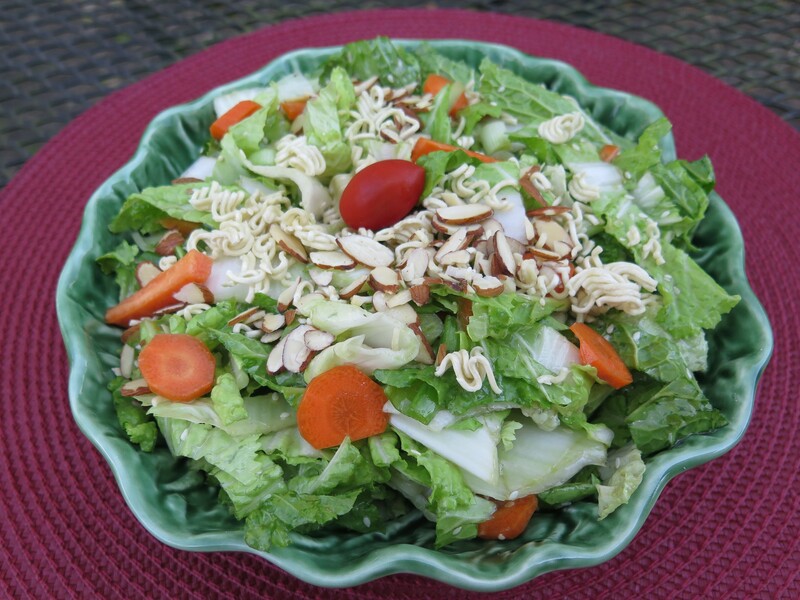 The inspiration for “Thai Crunch Salad” is my backyard garden. I planted an autumn garden on the first of September. A month later, I am pleased and proud that the pak choi has grown prolifically with very little help from me. It is ready for harvest and I need recipes.